Learn the feel of the correct clubface impact with the SKLZ Rick Smith Smash Bag. 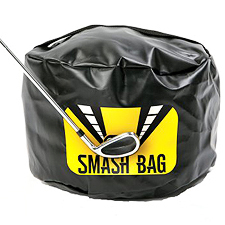 An ideal training tool for the beginning and intermediate golfer, the Smash Bag provides visual feedback on the quality and accuracy of impact. All you have to do is line up and swing, then take a look at the angle of the proprietary target map to see how you did. If your swing was true, the bag will remain aligned. If your swing missed the target or hit it a skewed angle, the bag will retain the depression for further analysis. On the whole, the bag helps eliminate fat and thin shots and cure slices. Made of a heavy-duty, high-impact material that quickly fills with towels or clothes, the Smash Bag is perfectly safe for both you and your clubs.